Electrons surround the nucleus of an atom in regions called energy levels. 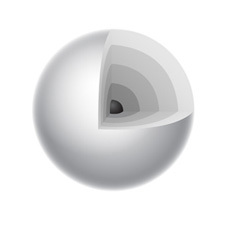 We can imagine that energy levels are shaped like spheres. We simplify this by drawing them as concentric rings. Later we’ll learn that energy levels take on a fantastic array of shapes, like this, but we’ll leave out these details for now. Atoms in the first row have one energy level. Atoms in the second row have two energy levels, and so on. This section comes from Lesson 4.3 The Periodic Table and Energy-Level Models: American Chemistry Society. Large dot in center = nucleus. Contains both protons and neutrons. Look at the periodic table. 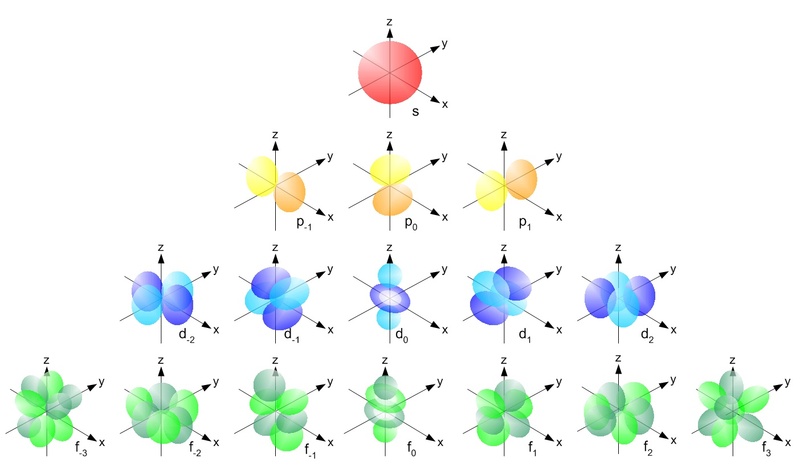 Which atom does the model below represent? Clue – Count the # of electrons! Each energy levels holds up to a specific number of electrons. Once an energy level is full, more electrons fill positions in the next level. Imagine people filling rows of chairs in an auditorium. If each person sits next to another, until one row is filled, any remaining people must take seats in the second row, and so on. 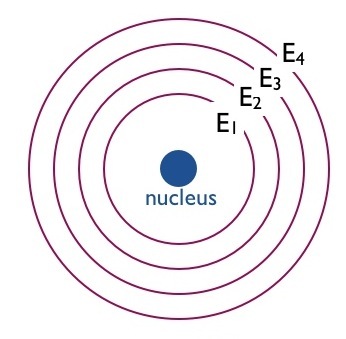 Electrons begin filling from the lowest level (closest to nucleus) and then move on to higher levels (further form nucleus). Not all energy levels hold the same # of electrons. occupying the second row. Then, if the second row were longer than the first row (but shorter than the third row), after 8 more people had been seated, any remaining individuals would have to begin occupying the third row. Extending our analogy of theater patrons as electrons, let’s look at how the element sodium, with its 11 electrons, might fill these energy levels. Because sodium has 11 electrons, it fills up the first energy level, which can hold only 2 electrons. It also fills up the second energy level, because it can only hold 8. Together, the first and second energy levels can hold a total of 10 electrons. Sodium has 11 electrons, so that final remaining electron that can’t be accommodated by the first and second energy level begins filling in the third energy level. This pattern generally holds for the first 18 elements, up through argon, which has 18 electrons. Whoa. Whoa. That’s crazy. Why does that happen? This is the second complication with our simple chairs analogy. It turns out that in addition to distinct energy levels (first, second, third, etc.) each energy level is further divided into sections where electrons can be found. In terms of our analogy, the first row would have just one section. The second row would have two sections. The third row would have 3 sections and the fourth row would have four sections. As you can see, the number of sections an energy level has is equal to the number of that energy level. Admittedly, this doesn’t look much like rows of charis in an auditoruim anymore, but the idea is still the same. Electrons will continue filling energy levels, one section at at time, until all the electrons are used up. When one section of the next energy level is actually lower in energy than the next section of the same energy level, the electrons will begin filling there. This is what we depicted in the diagram for potassium. Its last electron filled the first section in the fourth energy level, because that section was actually closer (at lower energy) than the last section of the third energy level. Eventually, the electrons will continue filling the empty section in the third energy level. The idea is exactly what we’ve just described. Unusual as it might seem, in some cases, the first section of the next energy level is filled before the electrons continue to fill the last section of the preceding energy level. Whew! So what does all of this mean? Mainly this: understanding how electrons fill energy levels can help us to understand why the periodic table has as many rows as it does. Each row can roughly be thought of as starting a new energy level. As we proceed across a row, electrons fill energy levels in sections according to where they can be at the lowest energy. So, rather than the row continuing on forever, the periodic table begins a new row which signifies that the electrons in the elements in the next row begin filling a new energy level. Activity: Place each element card with its correct atom. Teacher hands out 80 element cards: 4 for each of the first 20 elements. Each contains information about electrons and energy levels. Figure out which element the card is describing. Put the card at the spot in the room for that element. Review whether the cards were placed correctly. The image you project contains all of the electrons for elements 1–20. However, the periodic table on the activity sheet contains electrons only for the elements at the beginning and end of each period. Discuss the arrangement of electrons within the energy levels for these atoms and have students fill in the electrons for the other atoms. Note: In the energy level diagrams, the electrons are spread out evenly in the level. Some books show them spread out this way and some show them in pairs. The pairing of electrons is meant to represent that electrons are in separate orbitals within each energy level. At the middle school level, it is not necessary for students to learn about electron orbitals. This information is offered so that it is clearer to you why electrons are often shown in pairs in energy level diagrams and in the dot diagrams used as an extension at the end of this chapter. An orbital defines a region within an energy level where there is a high probability of finding a pair of electrons. There can be a maximum of two electrons in each orbital. This is why the electrons are often shown in pairs within an energy level. Tell students that the rows across on the periodic table are called periods. Explain that hydrogen has 1 proton and 1 electron. The 1 electron is on the first energy level. Explain that helium has 2 protons and 2 electrons. The 2 electrons are on the first energy level. Explain that lithium has 3 protons and 3 electrons. There are 2 electrons on the first energy level and 1 electron on the second. Explain that the first energy level can only have 2 electrons so the next electron in lithium is on the next (second) level. Explain that neon has 10 protons and 10 electrons. There are 2 electrons on the first energy level and 8 electrons on the second level. Help students fill in the correct number of electrons in the energy levels for the rest of the atoms in period 2. Explain that sodium has 11 protons and 11 electrons. There are 2 electrons on the first energy level, 8 electrons on the second level, and 1 electron on the third energy level. Explain that the second energy level can only have 8 electrons so the next electron in sodium has to be on the next (third) level. Explain that argon has 18 protons and 18 electrons. There are 2 electrons on the first energy level, 8 electrons on the second level, and 8 electrons on the third energy level. Have students complete the energy level model for argon in their periodic table. Help students fill in the correct number of electrons in the energy levels for the rest of the atoms in period 3. Explain that potassium has 19 protons and 19 electrons. There are 2 electrons on the first energy level, 8 electrons on the second level, 8 electrons on the third energy level, and 1 on the fourth energy level. Explain that after the third energy level has 8 electrons, the next electron goes into the fourth level. Help students fill in the correct number of electrons in the energy levels for calcium. Note: Students may wonder why an energy level can hold only a certain number of electrons. The answer to this is far beyond the scope of our unit:. It involves thinking of electrons as 3-dimensional waves and how they would interact with each other and the nucleus. Have students look for patterns in rows and columns of the first 20 elements in the periodic table. Continue to project the image Periodic table of energy levels for elements 1–20 and have students look at their activity sheets to find patterns in the number of electrons within each energy level. Have students look at the periods (rows going across). The atoms in the first period have electrons in 1 energy level. The atoms in the second period have electrons in 2 energy levels. The atoms in the third period have electrons in 3 energy levels. The atoms in the fourth period have electrons in 4 energy levels. A certain number of electrons go into a level before the next level can have electrons in it. After the first energy level contains 2 electrons (helium), the next electrons go into the second energy level. After the second energy level has 8 electrons (neon), the next electrons go into the third energy level. After the third energy level has 8 electrons (argon), the next 2 electrons go into the fourth energy level. Note: The third energy level can actually hold up to 18 electrons, so it is not really filled when it has 8 electrons in it. But when the third level contains 8 electrons, the next 2 electrons go into the fourth level. Then, believe it or not, 10 more electrons continue to fill up the rest of the third level. Students do not need to know this. Have students look at the groups (columns going down). Tell students that the vertical columns in the periodic table are called groups or families. Ask students to compare the number of electrons in the outermost energy level for the atoms in a group. Students should realize that each atom in a group has the same number of electrons in its outermost energy level. For instance, hydrogen, lithium, sodium, and potassium all have 1 electron on their outer energy level. Let students know that these electrons in the outermost energy level are called valence electrons. They are the electrons responsible for bonding, which students will investigate in the next lesson. Why do atoms in the same column have the same number of outer (valence) electrons? If you think about how the energy levels fill up with electrons, and how the periodic table is designed, you can see how certain atoms end up in the same column. An important point about the columns is that the number of electrons in the outer energy level, called valence electrons, will be the same for all the elements in that column. The periodic table is designed so that the first electron starting a new energy level starts a new row on the far left. Each new row starts after the outer energy level of the previous row has eight electrons. An exception to this is starting the second level after the first level has two electrons. Let’s look again at the energy level chart. With these principles in mind, you can see why the atoms in the first column, which contains hydrogen (H), lithium (L), sodium (Na), and potassium (K), each have one electron in the outer energy level. In the second column, beryllium (Be), magnesium (Mg) and calcium (Ca), all have two valence electrons. The atoms in the column with boron (B) and aluminum (Al) all have three valence electrons. The atoms in the column with carbon (C) and silicon (Si) have four valence electrons. The rest of the columns follow this same pattern. The transition elements in the middle of the periodic table (not shown in the chart) for the most part have two valence electrons.